Note: In contrast to the earlier tutorial on the Basic Floorplan Toolkit, this tutorial is mostly code-based. It is intended for newcomers to Glimmr who have a basic level of familiarity with Inform 7. While the tutorial touches on the creation of graphics, no real detail is provided and the user’s familiarity with graphics software is assumed. You may want to download the source code, images, and design files before beginning. The images and design files are in the public domain and may be freely used or modified for use in any project; please let me know if you use them! 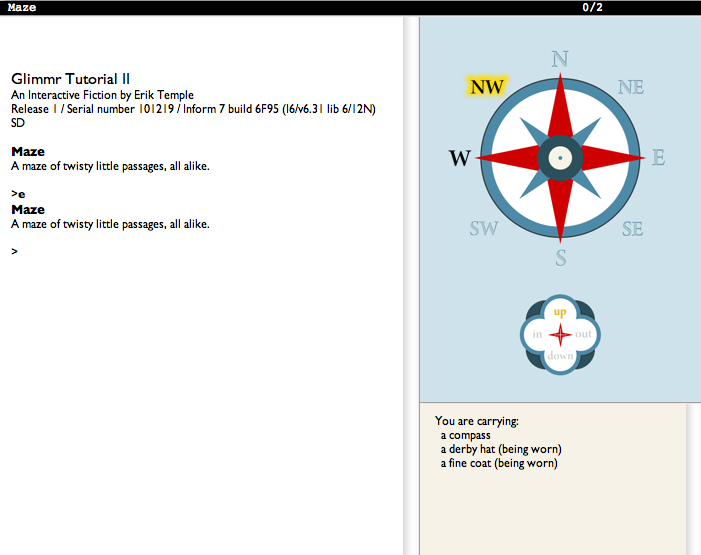 The text-based compass rose/exit lister from Emily Short’s Bronze. Red letters indicate that the player has not yet visited the room in that direction. In this tutorial, we’ll be creating a hybrid compass rose and exit lister using Glimmr Canvas-Based Drawing. Here’s what our exit lister will do: It will show, on a compass rose, the directions available to the player from the current location, and it will also indicate (via a yellow halo or highlight) whether the room in a given direction has yet to be visited. For completeness, there will also be a supplementary rosette to handle the non-compass directions (up, down, in, and out). Finally, and because it requires virtually no additional effort, we will also allow the player to click on any valid exit on the compass to issue the appropriate movement command. The end result of this tutorial, running in Gargoyle. Floor plan for a portion of Emily Short's Bronze. Room names expunged to avoid spoilers. As with other instances of the Canvas Editor, you build your floor plan visually in Basic Floorplan Toolkit, and then export Inform 7 source code which, when pasted into your game, will recreate your composition. 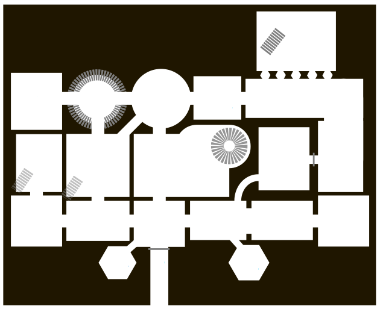 If you tweak a few things while setting up your plan, the map will be self-revealing, with each room appearing on the map only after the player has visited it. You can also set up a little Parcheesi piece to represent the player, and its movement through the map will be automated. Detailed instructions for the use of the Canvas Editor can be found in that extension’s documentation. This tutorial is intended to allow interested folks to get into using the Basic Floorplan Toolkit with a minimum of background reading. You can download a game file (gblorb format) of the map we will be creating here.